Just as Rodney and Carmen Lott tried to explain on Friday afternoon how the nearly complete new home just a few steps away from them would change their lives, they were interrupted. 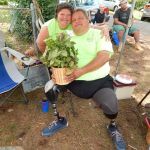 A florist was there to deliver a housewarming plant — a gift from their new next-door neighbor, Rachael. They were getting used to such interruptions. Since volunteers began raising the walls on their new home just a few days earlier on June 18, 2018, the project was hit with a slew of positive surprises and unexpected blessings on a daily basis — in addition to all of the hard work and blessings that paved the way for the project in the first place. The entire build was a conglomeration of everything that makes the Chattahoochee Fuller Center Project one of the most thriving in the United States. Another neighbor rode down the street to the work site along with his poodle on a zero-turn mower each morning to deliver waters for the dozens of volunteers, most of whom came from the Chattahoochee Valley, but a team of 10 came from Pennsylvania — including house leaders Barry and Amy Stuck. Several area churches supported the build and sent youth volunteers. Other volunteers included men from New Birth Ministries’ transitional program. Nearby West Point Mayor Steve Tramell also was a house leader. And Chambers County Sheriff Sid Lockhart grilled burgers for all of the volunteers on Friday’s dedication day. Dozens more, too many to list, also worked on the home. In-kind gifts such as OSB from Norbord, shingles from World Vision, insulation (and employee volunteers) from Knauf, HVAC from 4 Seasons Heating and Air, countertops from A&X Granite & Marble, paint from Behr and enough Hardie Board for this home — plus two more planned for September — means the house will be even more affordable as the Lotts repay the costs of building the home with a zero-percent interest mortgage that will go toward helping others in the community get the same hand-up. The Lotts cannot wait to make their first payment. Chattahoochee Fuller Center President Curt Johnson said the teamwork and community involvement seen this week is no coincidence but the result of years of cultivating relationships and producing results. 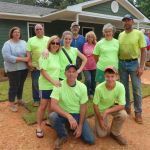 He added that this project’s homeowner partners have many friends throughout the community, only increasing the volunteer interest and financial support. 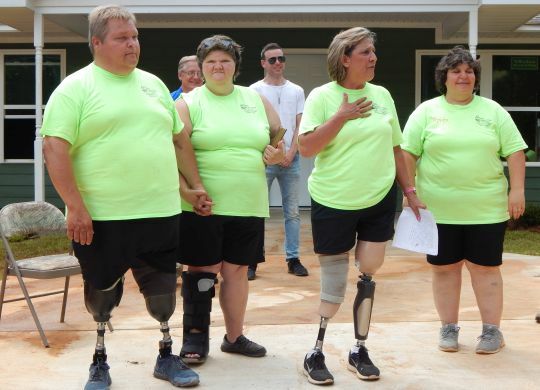 “We had so many people come together, so many businesses and so many industries, and a lot of our individual donors came forward when they found out who the homeowners were,” Johnson said. Indeed, the heat was oppressive all week long, yet the volunteers and leaders fought through it and have the home nearly ready for the Lotts to move in — something they will do in July. Even though he and his Pennsylvania crew are more used to milder summer temperatures, house captain Barry Stuck had no complaints. Like the CFCP’s Roberts, Rodney Lott is a double-amputee. The amputations were necessary to stop the spread of a bone disease. Also like Roberts, he deals with his condition with a sense of humor and a never-ending drive to serve others and share the love he has for everyone he meets. Each day of the blitz build — as with almost every Fuller Center build across the nation and around the world — began with a devotion. Friday was Rodney’s turn to deliver the devotion. He focused on one word: wanted.